When it comes to travel, I am definitely a planner. I don’t want to head to a city or other destination without some general idea of the things I’ll do and especially the places I’ll eat. However, I often find that some places we find spontaneously turn out to be some of the best things we do. I spotted this little comic shop a short distance away from our AirBnB while we were driving and looked it up later on. 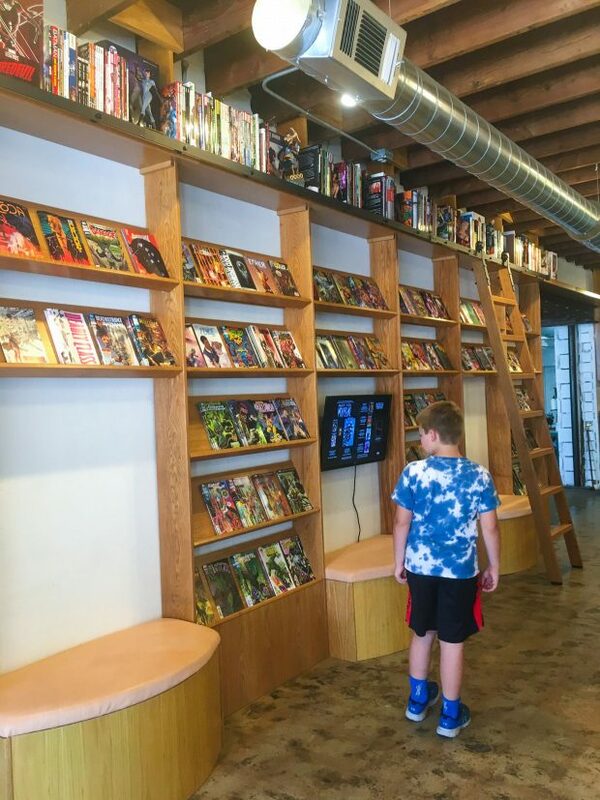 It turns out it is a really cool concept – a non-profit comic shop that raises funds for educational opportunities! Andrew is really into comics and especially all things Marvel, so we went several times during our visit. The location pictured here, near where we stayed, was brand new at the time and unfortunately didn’t have the beer/wine component of the shop up and running yet when we visited. It didn’t matter to Andrew of course, who just couldn’t get enough of this place. The staff was really friendly and welcoming, and I appreciated all of the attention they gave to an incredibly enthusiastic and talkative kid. Note: The location we visited appears to have closed now (not 100% sure) but the address above is for the original spot and looks really awesome too!